"We are with you at any Critical Conditions"
Home Body Disorders "We are with you at any Critical Conditions"
The critical care department of SevenHills Hospital provides Comprehensive Care and Life Support Services to patients who are critically ill and require intensive monitoring. The equipments and state-of-the-art infrastructure of this department meet international standards so as to assist patient recovery. The critical care services are spread over a number of intensive care units (ICUs) that are dedicated to provide compassionate intensive care to seriously ill patients. The well-staffed ICUs are located on Level 3 and Level 4, where specially trained ICU staff will ensure that all patients get the best medical care in a comfortable and cordial environment. All ICUs are well equipped with the most advanced technologies to treat patients with dysfunction of vital organs because of acute conditions like infections, heart attack, stroke, renal failure, trauma, poisoning, drug overdose and burns. 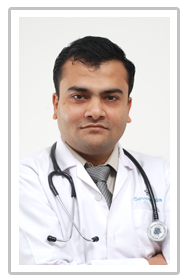 Dr. Anuj acquired valuable experience in managing brain dead donors, liver, bone marrow and renal transplant recipients. He did his Post doctoral Fellowship in Critical Care Medicine from National board of Examinations. He enhanced his skills in advanced management techniques e.g. HFOV, ECMO whilst working at Westmead hospital in Sydney. Dr. Anuj is certified by the American Heart Association as a Basic and Advanced life support trainer and is a visiting lecturer at Life supporter’s institute of Health sciences. SevenHills Hospital is equipped with a huge set up of 300 beds allocated to Intensive Care Unit (ICU). The ICU has the most advanced technology and equipments like advanced generation 4 ventilators, multi para monitors, defibrillators, bronchoscope, Intra Aortic Balloon Pump and Bed side Echocardiography. Is there any special care taken to prevent spread of infection from one patient to another in the ICU? Will the doctor who was initially treating the patient also keep a track of the patient in the ICU? The Intensive care is a team approach with Intensive Care Physician leading the treatment in conjunction with the primary admitting doctor. The primary doctor will be kept informed of the ongoing care and patient’s condition. Will the relatives be informed about the progress of the patient from time to time?